UGH WORDPRESS- here is the post that was schedule for yesterday! I have a hard time loving Halloween. Trust me, I have tried to get into the spooky spirit, but always find decorating for the holiday a little too cheesy for my taste. 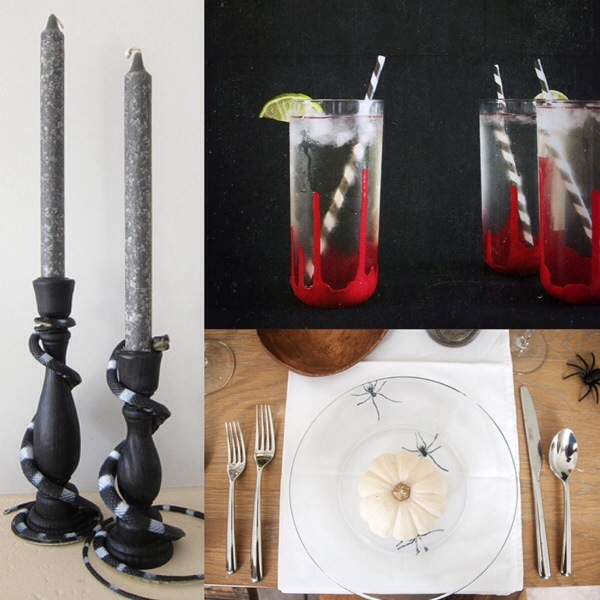 Instead of trying to decorate the house, I am opting to do my version of a classy (ugh, I hate that word) Halloween table setting by adding some simple scary touches to my everyday tableware. Here are some of my favorite finds that have me ready to hit up my local Michaels this weekend. These bloody cups are simply genius! Snake Candleholders, yes please! I might spray paint mine silver to tie the center of the table together. Spider Plates– the perfect DIY to add to your everyday plates or for a larger event you could apply this to clear plastic ones to make them extra special. I have a couple of Halloween parties coming up and still no costume. Any ideas?